"Larry entered the UM in 1958 and found he weighed 190 after a Summer of construction work. Coach Andy Gustafson found him to be a quick learner and, after the third game of his sophomore year, Larry and the wild man on the other flank, Bill Miller, whipsawed secondary defenders in every part of the nation. Their threat was constant, although Larry never played with the same quarterback twice--Fran Curci, Eddie Johns, and George Mira were the pitchers, Miller and Wilson the catchers. A tricky split end, Wilson did his part and a bit more, on some of Andy Gustafson's most exciting teams. Wilson's UM baseball class had some exceptional players and--in three varsity years--they had a couple of great seasons. Wilson's soph year was ordinary, improved the next season and the big first baseman hit .459 in his senior year. The Kansas City (now Oakland) A's signed him with a bonus that was halved when Larry suddenly realized he was subject to a military obligation he couldn't avoid...and his first, 60-game season in Minot, South Dakota wasn't too swell, either. The next spring, instead of heading for spring practice, he went to Germany as a guest of the Army and--when Lieutenant Wilson got home--he was two years older, had a family and, as ever, a flaming desire to play baseball. 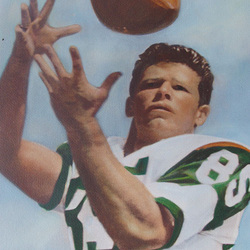 And he played it, with teams like Vancouver (AAA) and Dallas-Ft. Worth (AA) but his great chance in the big leagues eluded him...Finally, in 1968, Larry chucked his dream and returned to the UM as a coach of receivers under Charlie Tate. Larry turned out some excellent catchers of football. Even here, Larry Wilson had circumstances working for him, for he had picked up a masters degree in Business from the UM somewhere along the way...which is the provident kind of thing to do so easily. Like one night in the Orange Bowl, against a tough North Carolina football team. The Miami quarterback of the moment loped off the field after scoring a touchdown--so Larry Wilson called the team into the huddle, ticked off a play and threw a pass for the two-point conversion. He threw that pass to Bill Miller, of course." The UM Sports Hall of Fame is saddened to learn of the passing of member Larry Wilson. Larry was inducted in 1973, as a two-sports athlete (football & baseball). He served as President of the Hall 1987-1989, and was instrumental in getting the Tom Kearns Sports Hall of Fame Building built and opened in 1989, as he served as Building Chairman, as well. Larry was an outstanding athlete and a great friend of the UMSHoF. He will be greatly missed. Sadly, Larry Wilson passed away on February 5th, 2019.